I am tired of being used, hurt, and cast aside. Adelina Amouteru is a survivor of the blood fever. A decade ago, the deadly illness swept through her nation. Most of the infected perished, while many of the children who survived were left with strange markings. Adelina’s black hair turned silver, her lashes went pale, and now she has only a jagged scar where her left eye once was. Her cruel father believes she is a malfetto, an abomination, ruining their family’s good name and standing in the way of their fortune. But some of the fever’s survivors are rumored to possess more than just scars—they are believed to have mysterious and powerful gifts, and though their identities remain secret, they have come to be called the Young Elites. Teren Santoro works for the king. As Leader of the Inquisition Axis, it is his job to seek out the Young Elites, to destroy them before they destroy the nation. He believes the Young Elites to be dangerous and vengeful, but it’s Teren who may possess the darkest secret of all. Enzo Valenciano is a member of the Dagger Society. This secret sect of Young Elites seeks out others like them before the Inquisition Axis can. But when the Daggers find Adelina, they discover someone with powers like they’ve never seen. Adelina wants to believe Enzo is on her side, and that Teren is the true enemy. But the lives of these three will collide in unexpected ways, as each fights a very different and personal battle. But of one thing they are all certain: Adelina has abilities that shouldn’t belong in this world. A vengeful blackness in her heart. And a desire to destroy all who dare to cross her. It is my turn to use. My turn to hurt. 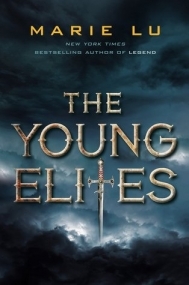 The Young Elites is a series best read cold--knowing anything about the plot might elicit expectations that won't be met. Instead, I'd encourage readers to go in and let Adelina guide you through her story. That said, Adelina Amouteru is not the easiest YA heroine to know, and her polarizing characterization will likely inspire debate between readers, even as they continue to turn the pages. Adelina is cursed by a disease that left her with powers she can't control, and a father who hates her. The kindness of her sister is quickly gone from her life, as Adelina sets out on her own, and finds a group called the Young Elites. The Elites are powerful as well, their abilities leading to fear of all Malfettos throughout the kingdom. As Adelina decides what she wants to be--Elite or independent--conflicts rage around her. I loved this book for its characters, especially Adelina. Her undeniable anger and fierce passion is so rarely encountered in YA, whether or not readers will agree with her decisions. Seeing characters who aren't demonized for impractical or strange decisions is important for teens, and Adelina's choices will definitely lead to some interesting conversations. As a group, the Young Elites are a compelling bunch of outsiders, though I'm much less interested in Enzo as a love interest than I am as a leader. Raffaele is even more enchanting, his perspective on Adelina surprising me on every page he shows up. It's in his interactions with Adelina that I see them both more clearly, and their awkward friendship feels honest and true. The weakest point in the story is definitely Teren. While he is certainly malevolent and unlikeable, it's not his evil actions that leave me wanting, but the lack of compelling motivation behind them. It's hard to believe that Teren would have these specific reasons to hate the Malfettos, without more backstory to support his intense hatred. Pulling all of these characters together is Marie Lu's signature writing style, punchy and clear and fascinating. Readers familiar with the Legend series may find Adelina more frank and unforgiving a narrator, but I enjoyed the openness of her POV. It was refreshing to feel like I was really getting to know Adelina, even the ugly thoughts she was afraid to think. Overall, The Young Elites was a strong start to the series, and easily one of the most resonant novels I read in 2016. Marie Lu’s newest series The Young Elites was everything I had hoped from her and more, and I want to hit past-me for being so hesitant to pick it up. The story is so character-driven and wonderfully developed I found myself gasping in disbelief and excitement continually throughout. What finally convinced me to dive into this new world from Lu was the elements of the book: a haunted, physically-abused protagonist, a multifaceted villain, friendship, male courtesans, and, the piece de résistance, a conspiracy to usurp the throne. It completely astounds me why I didn’t read it any sooner. Adelina Amouteru is just one of the many victims of a vicious blood fever that swept through the Kingdom years ago, killing many of the adults and physically scarring the children. She is branded a malfetto and it is considered a great stigma to be, in anyway, associated with one. This does not bode well for her father, who is convinced to sell Adelina as a mistress to reinstate the fortune he lost when his daughter became a malfetto. Adelina’s only option is to run away, but she does not get very far before her father discovers her and, in her rage, she kills him with some sort of terrifying power. She is arrested by the Inquisition and sentenced to death, but saved at the last minute by the Young Elites, a group of cursed malfettos, who, after the fever, were gifted with strange powers which the Kingdom is terrified of. Adelina is taken to a lush, frescoed brothel were she must prove if she is worthy enough to join the Young Elites. The leader of the Young Elites is Enzo, the Crown Prince, who is also a malfetto and had his rank as heir, as well as position and power, stripped by his sister who succeeded to the throne after him. Adelina is given the chance to join this secret group, called the Dagger Society, in order to restore the prince to his throne, but only if she can develop her hidden powers, powers she did not know existed within her until she killed her father. If she fails in any way, or betrays the Young Elites, her life is forfeit. But, Enzo’s plans are even more ambitious. He doesn’t want to merely take back his kingdom, he wants to change the way the entire world views malfettos: as something more than curses and disgraces to their families. They are human, too. But they are more powerful. And deadly. The premise of the novel was incredibly exciting and stimulating and I just couldn’t put the book down. The world-building was simply incredible and very clear that Lu has taken great inspiration from Renaissance Spain. The Inquisition was an immediate throwback to Renaissance Spain and really highlighted the influence and authority religion and those in power can wield over the masses. I don’t think I have ever truly loved and reviled a protagonist as much as Adelina. What sets her apart from all other YA heroines is simply that: she is not a heroine. She is the villain. We are reading the origin story of a fearsome villain, who the entire world has turned their back on. With all that happens to Adelina, it is no surprise, then, that she becomes the villain. She has this darkness inside of her that originates from her anger and bitterness. What I love most about Adelina is the fact that is physically disfigured (that sounds weird): due to the blood fever, Adelina lost an eye and her hair turned silver, which frequently changes different shades as she experiences certain emotions. Adelina discovers she, too, has powers, but powers that are far more deadly than the other malfettos. She has the ability to manifest illusions, primarily in the form of terrifying shadows; she can induce pain which can result in death, create a cloak of invisibility and mask features over someone’s face. She spends the majority of the novel perfecting her growing powers, which frightens a few of the other Young Elites, especially Raffaele. Raffaele was my absolute favourite character (surprise, surprise). He is a Young Elite and member of the Dagger Society, known as the Messenger. He is also Enzo’s right hand man and works as a consort, secretly building political alliances for Enzo and the Dagger Society. His power is that he can sense energy from other people, specifically the Young Elites. I loved watching him use his powers: not only can he sense energy, he can also manipulate it somewhat which results in people trusting him, falling in love with him, or simply feeling calm in his presence. Despite this, I can sense a darkness in him, too. He is a very complex character in that he is sweet and flirtatious one moment, but could potentially betray you in the next. He immediately senses the darkness within Adelina and, despite being her closest friend, frequently tells Enzo behind Adelina’s back to kill her as he believes she is a danger to them all. He is, after Enzo, the most powerful member in the Dagger Society. At the conclusion of the novel, it is suggested he was the one in charge all along, which made me smile. I love a powerful leader who hides behind an innocent façade. I am a deformed creature, he mouths silently, repeating the words he once said as a twelve-year-old boy, an Inquisitor in-training, kneeling before the sixteen-year-old Princess Giulietta. Another character I had a love/hate relationship with was Teren, the leader of the Inquisition. In a novel with no heroes and only villains, this guy was obviously cast as the main villain. Teren was an interesting character: he grew up in a religious and disciplined household, and has constantly had to live up to his father’s expectations. Like his father, he becomes the leader of the Inquisition and is dedicated to ridding the world of all malfettos. But Teren has a secret: he, too, is a malfetto and one with powers – he is essentially invincible as he can heal from any harm inflicted upon him. Teren is cruel and sadistic and manipulates Adelina into spying to the Dagger Society for him. Despite being enemies, I am convinced that Teren and Adelina might eventually get together (maybe the second or third book?) However, Teren is completely in love with Enzo’s sister, Giulietta, who convinces Teren to kill her husband so she can take control of the throne, and Kingdom, herself. I really look forward to exploring more of Teren’s character in the next book. As we develop Adelina as the villain, I hope we can discover what made Teren one, too. Marie Lu has created a fascinating world in The Young Elites. I don’t think there was ever a moment where I felt relaxed or calm – I was constantly at the edge of my seat. I can’t wait to delve into The Rose Society and am even more excited for The Midnight Star to be released this August. I don’t think there has ever been a YA novel that focuses on the origin story of a villain. I expect great things from this series and can’t wait to see where Lu is going with all this. Adelina is only 16 and is a malfetto, someone who survived the blood fever and now has markings. Hers are silver hair and that she lost an eye. Her father hates her and loves her younger sister. At the beginning of the book, her father sells her, she finds out and runs away. Her father chased after and she uses powers of illusion that she never knew she had. She is captured. After being held as a prisoner, she is taken to be executed. She barely escapes with the assistance of her powers and The Young Elites. I went into this with no expectations whatsoever. I've never read anything else by this author - Marie Lu. I can say I felt bad for Adelina, her father hates her and sells her to a man. That is seriously messed up. It really plays up the saying that the youngest is always the favorite. Adelina's little sister gets everything. She finally decides that she has had enough and runs away, though everything gets worse from there. She kills her father and almost dies by being burned alive. She is saved by The Young Elites and taken to their safe haven and slowly begins her training. Teren finds her though and he says he will kill her younger sister if she doesn't help him take down The Young Elites. So our girl becomes a spy to save her sister. Everything goes wrong from there, people die and there is a pretty big twist that I didn't see coming. It's a book that really stuck with me. It left me thinking about it long after I put it down. I will say it's not a book I will read again though. I loved that the author told a story from the villain's point of view but I just couldn't connect. Also, I love romance. I have insane love for a book with cute romance. This had a couple kisses and a few feelings. Nothing cute and I don't even see how she could like him when she barely knew the guy! Enjoyable fantasy, interesting to see how some of the plot lines will pan out. I wanted to read The Young Elites because I read and loved her Legend series. The premise sounds great, and I have the faith that she can write characters to make me love them, and a plot that is fast paced. I really enjoyed Adelina. I wasn't sure what to expect with the synopsis calling her heart black and her quest for vengeance. It sounded like she was more of a villian than protagonist, but she was pushed to the edge of society basically for surviving. She and others like her that survived the plague that killed so many left some of the children marked, with physical marks and even more rarely with supernatural talents. She went most of her adolescence not really knowing that she had any sort of powers, just knowing that she has silver hair that still shifts colors as well as a scar from having one of her eyes removed. But her father has always preferred her non-scarred sister, and was cruel to Adelina. She discovers her powers when she is physically threatened and she is running away from being sold as a mistress, because even though she's marked, she is still beautiful. It is just that malfettos, what they call the children, now teens who are different, aren't socially acceptable to marry. Many want them all killed, and when she displays her powers and accidently murders, she is then facing death. She is rescued by the Young Elite, what those with supernatural powers call themselves. She has to decide if she wants to train with them, under the leadership of Enzo. Their mission seems to be to overtake the throne. The heir currently in line for the throne Teren is hunting for Adelina, and he is part of those in power who wants them killed. But their paths of course, are all destined to cross and intertwine. To keep her younger sister alive and safe, Adelina also has to make some pretty hard choices. There were some times when I was a bit confused at exactly what was going on, but that is not uncommon for me and fantasy. I still enjoyed and will read the next. The plot is fast paced, and even though Adelina has some pretty dark powers, and she has to walk a thin line of control and fury, she is still the main character, and I appreciated her character development. She does end up unleashing some pretty dark things, and she has to live with those consequences. Her path with the Daggers isn't an easy one, and she also wants to save her sister. I did like that bond, finding out all Violetta has done for her, and loved her, protected her even when Adelina didn't realize it. I always like a strong family bond in my books, so that did make me happy. Especially with the father that treated Adelina so negatively. I was pretty sad by one of the developments in the story and wonder what it will do to effect the bit of romance that was there, but the epilogue does give me an idea, but it also worries me at the mention of the brother and his changes. Bottom Line: Enjoyable fantasy, interesting to see how some of the plot lines will pan out. Not as Amazing as Legend, but Still a Great Book! This book was definitely not what I was expecting. I didn't like this book as much as I hoped, but I did end up liking it. The main thing that surprised me about this book was how dark it ended up being. The book's world is so interesting! It takes place in a fantasy world with many dystopian aspects and kind of a resemblance to a renaissance Venice. The world-building was very well-done, though, as I said, very dark. In this world, there was a fever that struck and all the adults with the fever died, children who had the fever and survived (not all survived) came out of it with special abilities. They are called malfetto. All of them are marked in some way (EX: Adelina has silver hair). Malfetto are feared and often killed for suspect of being with The Young Elites. The Young Elites are a group of Malfetto that are aiming to take back the crown to its rightful owner. The overall world in this book is just so extraordinarily developed! The characters in this book are a very interesting mix of characters. You will not see any cliche characters in this book. All of them are very different than the usual batch of characters seen in YA books. I'll say this again: they are dark. An example would be Adelina, who has had such a hard life and she is full of such darkness. Another thing I should warn you about: Marie Lu is not afraid of killing off her characters. There is a brief romance in this book, but it does not distract from the storyline at all. In fact, there is hardly a romance at all. My only issue with this book is more of a "It's not you, it's me" thing. I just could not relate to the characters. Did I feel for them? Yes. But they just felt flat to me. Same with some of the story. Though, this book is in third person and I usually have that issue with third person books. This is a very dark dystopian/fantasy, but very well-done. The world is very developed and the characters are a breath of fresh air compared to most YA books. I had issues with relating to the characters, but all-in-all, a great book! I do recommend this book (and the Legend trilogy) and I will be continuing the series! Characters & Relationships: the thing that I most liked about this book is the complexity of its characters, they aren't any character that can be classified as just good or bad, all of them have shades to their self & unique personalities. Adelina is our main focus, despite the other POV's, give the more clear vision of this - despite doing some pretty bad stuff we always see her reasons for it, there isn't violence just for violence or bad decisions made just for some rushed reasoning, all the decisions Adelina takes are for a very deep reason and is what make her the person she becomes. Of course that with complex characters we have complex relationships friendships, romance & family all are painfully real and complicated, I can already see the heart ache that the next installment in this series will bring me. World building & pace: The world building in this one is definitely one of my favorites, Marie Lu does that thing where she describes this world while narrating and you don't even feel like it's world building, you just start to imagine the descriptions in your head and BAM! when you realize you're already totally immersed in this new world. I have to say that I found this book rather slow, there is some action in it but I think most part of the time was spend on building the set for the rest of the series - which is awesome because this series has so much promises to become even greater. Recommended to: lovers of fantasy, lovers of fantasy looking for a more dark setting/characters, readers that like complex characters & characters that are usually bad, readers that like to read about people with powers.